The session of the political council of Georgia’s main opposition party, the United National Movement (UNM), failed on Tuesday due to the lack of a quorum. Only 27 persons out of the 60 member political council appeared at the meeting. That was not enough to hold the convention. After the failed political council session, the meeting of the party members was held at the party’s main office. Member of the UNM Giga Bokeria stated after the meeting that the failed session was the fault of ex-President and founder of the party Mikheil Saakashvili, who at present is an Ukrainian citizen and observes developments within the party from abroad. He said that some members of the party did not appear because they follow Saakashvili’s directions, which leads to division within the party. “This group of people are disrupting the party,” stressed Bokeria, and added that the diversity of opinions within the party members is a democratic process and should not turn into confrontation. Another member of the UNM, Zurab Chiaberashvili, expressed concern that more than half of the political council members did not appear at the session. “We are facing the reality that the party's governing body was announced practically ineffective and dysfunctional. It is a pity that we turned into this deadlock," he stressed. 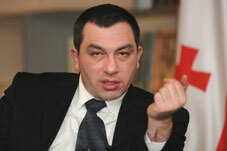 However, UNM member Akaki Bobokhidze believes that “Only one person can rescue the party from falling apart – Mikheil Saakashvili. Our country and voters need the unity of our party,” he added. The inter-party confrontation within the UNM started after the October parliamentary elections, when the majority of the UNM’s political council rejected Saakashvili’s calls to boycott the legislative body and started to prepare for a congress to elect a new chairperson. On November 30, 25 members of the UNM political council voted in favor of the decision to hold a congress with the participation of 7000 delegates, as Saakashvili wanted it. A total of 24 members voted against and stated it would be better to hold a 2000 delegate congress and elect a new chair of the party. Some party members are in favor of electing a new chairperson, as Saakashvili is now a Ukrainian citizen, but another wing demands to leave the post vacant saying the election of a new leader would mean distancing of Saakashvili from the party. The party’s congress is scheduled for January 20. However, the party members have not finally agreed whether to hold or postpone the gathering at all.